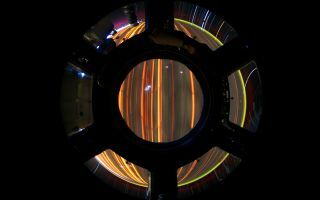 Expedition 31 Flight Engineer Don Pettit took photos of star trails, terrestrial lights, airglow and auroras while aboard the International Space Station. Image taken April 5, 2012. In this cool space wallpaper, Expedition 31 Flight Engineer Don Pettit took photos of star trails, terrestrial lights, airglow and auroras while aboard the International Space Station. Image taken April 5, 2012.